Sometimes, the usually unseen elements in your home can be the most important when it comes to saving money on your energy bills. When it comes to insulation, for instance, re-insulating your attic with new insulation, or by adding more, can save you between 10 to 20 percent on your energy bill every month. If you’re wondering if this might apply to you, read on! If your floor joints are visible or the insulation looks compacted or well-trod upon (shown below), then yours needs improving. Pretty easy, no? Over time, some insulation settles, namely cellulose, but years and years of dust can compress fiberglass as well. If you can see the tops of the joists, for instance, you probably have R-19 in your attic, and even that may be generous. For comparison’s sake, the recommendations for homes in our area (Climate Zone 4) start at R-38. 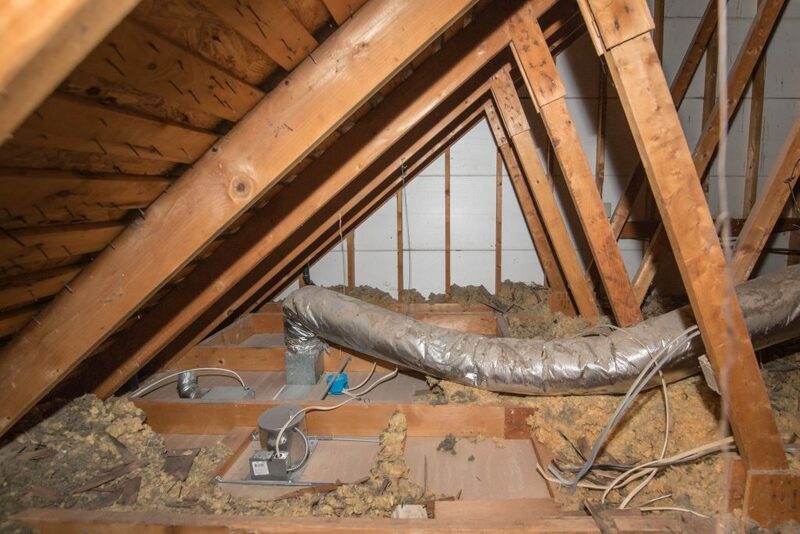 If your attic looks like this, the heated air in your living area is escaping upwards through thermal flow. That means the money you are spending on trying to keep your house warm is going right out the door (or ceiling), literally, as the heat continues to escape your home and cost you more money. If your roof is leaky, has been leaky or your insulation has encountered any other kind of wetting, it’s probably time to replace it. Moldy, wet insulation not only causes energy-efficiency issues but can create health problems as well. There are two options available when it comes to re-insulating your attic. First, you can add more loose-fill insulation to what is already there. In this scenario, we would recommend fiberglass on top of whatever is currently in place, as it’s not heavy enough to compress the existing material. Second, you can remove the current insulation, air seal the attic floor and then re-install loose fill. We recommend fiberglass for this as well, primarily for safety reasons. Both of these options are guaranteed to do their job of re-insulating your attic. There’s a third option, but it falls on the “less recommended” side. This option would be installing spray foam on the underside of the roof deck. We don’t recommend it around here for several reasons. First, spray foam is more expensive without being clearly better. 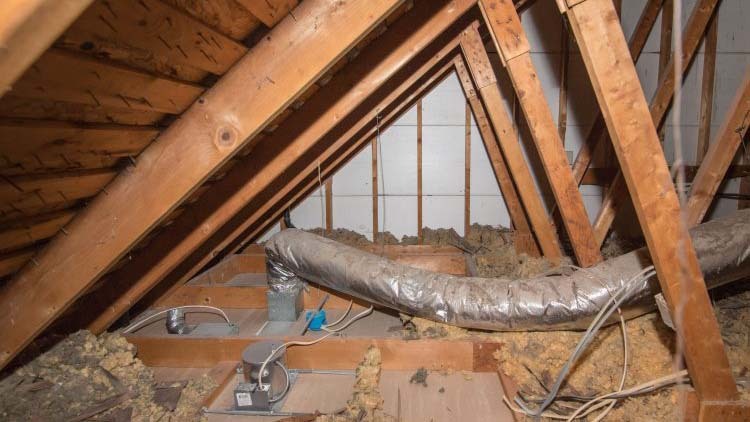 It can negatively affect the roof deck and/or shingles; it moves the thermal boundary of your attic area which creates a much more substantial volume of air that will be heated and cooled and can be detrimental to the health of the home occupants, depending upon how the ventilation is set up for combustion appliances. That said, sometimes, particularly in much older homes, spray foam may be the only way of getting any insulation in an attic area. Also, if your attic has your HVAC equipment in it, enclosing the attic area can help your equipment’s performance. So, if your attic insulation looks compressed and you have decided you qualify for an insulation upgrade, contact us today!